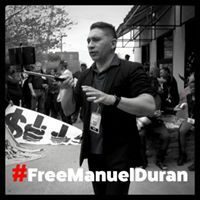 Manuel Duran Ortega is a well-known and respected journalist in Memphis, TN. A former TV station manager in El Salvador, he came to the US more than a decade ago as an undocumented immigrant after his life was threatened. Duran was arrested by Memphis police on April 3, while covering a local immigration rights protest that took place during the commemoration of the 50th anniversary of the assassination of the Rev. Dr. Martin Luther King Jr. Despite wearing a press badge around his neck, the police arrested him and charged him with disorderly conduct and obstruction of a highway or passageway. The Memphis police dropped the charges on April 5, and then turned him over to U.S. Immigration and Customs Enforcement (ICE). He has been held in an ICE detention center in Jena, Louisiana ever since.